In his article Römischer Katholizismus und Politische Form, Carl Schmitt affirmed that the reality of an economic process cannot be represented. According to Schmitt, economy is what it does. Unlike categories such as “God”, “The People”, “The State”, “The Public”, “Freedom” or “The Principle of Equality”, the economy is unrepresentable; it cannot be real if it does not exist – it is matter of fact. As a political and juridical sphere, the act of representing a value, a believe, a principle gives a special dignity and authority to the agent of representation because who or what represents a high value – i.e. something that must be persuasive, or that has to feed a pathos of conviction – cannot be itself devoid of moral value. Moreover moral value is not only a prerogative of who represents and what is represented. It is also conferred upon the subject at whom a representation of something is addressed. The crude reality of the economy deals with data that are in themselves devoid of any moral value and, thus, of any representational authority. According to Schmitt, there is no possibility to establish any condition of value or charisma in a world reified by the managerial apparatus of the economy. Unlike traditions of representation like those of the church, the monarchy, and the state, whose masteries are based on metaphysical and transcendental values, the abstraction of the modern factory is incapable of representation to the point that, as Schmitt reminds us, the Soviet Republic had to use obsolete emblems of work such as the hammer and the sickle (whose symbolism did not corresponded to the technically advance way Lenin defined Communism as “Soviets plus Electrification”) in order to find a “representative” symbol for Communism. It is possible to argue that it is precisely the impossibility of any convincing representation of a world reified by the management of economic processes that created fertile ground for value-free aesthetic expressions. For this reason it is not surprising that with the rise of industrialization and its expanding universe made of increasingly advanced forms of production, art and architecture were no longer considered as an embodiment of values beyond themselves, but rather as realities within themselves. And yet the condition of the generic is not simply a result of industrial modes of production. The generic is an anthropological dimension of subjectivity that is of fundamental importance in capitalism. In order to extract surplus value from workers, Capital has to conquer and appropriate worker’s labour power. Labour power is not a specialized sphere but it represents the totality of the human condition. Labour Power is generic, undetermined potential “where one particular type of labour or another has not been designated, but any kind of labour is taking place, be it the manufacturing of a car door, or the harvesting of pears, the babble of someone calling in to a phone “party-line,” or the work of a proofreader.”6. Paolo Virno, The Grammar of the Multitude (Los Angeles: Semiotexte, 2004), p. 81 Labour power coincides with the generic ability to act, to speak, or to do things both with our hands and with words. Labour power relies on a fundamental characteristic of the human animal: its ability to adapt to and to cope with any unforeseen situation. The spatial indeterminacy of the free plan is a radical manifestation of how labour power has been put at work by capital. If labour power is characterized by man’s ability to adapt to any situation, and therefore by the total unpredictability of man’s actions and reactions, then the only corresponding spatial form in such unstable conditions is free space: space emptied of any obstruction and ready to accommodate any situation. The history of capitalistic spatial governance can be understood as that of the possibility of accommodating the condition of permanent unpredictability and instability that is inherent to human nature. If labour power – the very object of any economic process – can be understood as the even covering of the field of human potentialities (from body to mind), then the spatial apparatuses that correspond to this reality have to reach the same degree of openness and potentiality of use and occupation. This condition becomes even more radical when “production” is no longer understood as the production of goods, but as the production of immaterial facts such as services and information. When language, cooperation and exchange become the main instruments of production, as occurred in the so-called post-Fordist economy – the diagram of spatial relationships becomes so complex and ever-changing that it becomes impossible to translate it into a fixed spatial arrangement. The increasing importance of tertiary and intellectual work within the development of industrial cities was already becoming evident in the 1920s, particularly in Germany and the US.7.On the rise of white-collar and intellectual work as mass work phenomena, see Sergio Bologna, “I lavoratori della conoscenza fuori e dentro l’impresa”, in Ceti medi senza Futuro? Scritti, appunti sul lavoro e altro (Rome: Derive e Approdi, 2008), 108–36. Also relevant is Sergio Bologna “Nazismo e classe operaia”, paper presented to the Camera del Lavoro in Milan, 3 June 1993. [An English translation is available here] While industrial work was dominated by the rigid pattern of the assembly line, in which workers were the silent controllers of machines, tertiary work was already seen as being carried out by a multiplicity of human relationships and associations whose unpredictable pattern overcame any rigid organization of space. 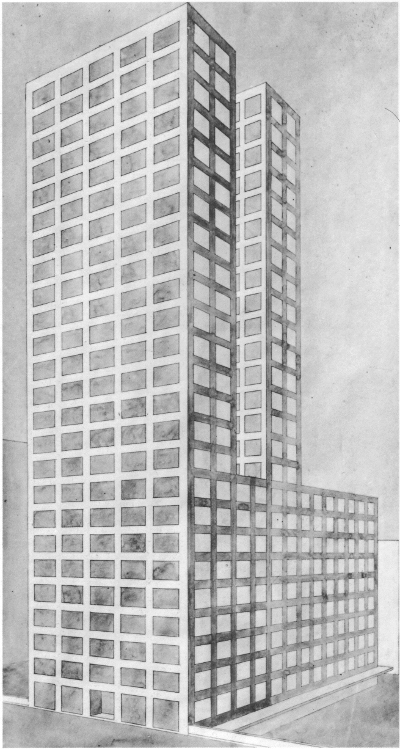 Hilberseimer’s proposal for the Chicago Tribune building takes this reality into account by reducing architecture to its barest formal state: generic floors supported by a homogeneous field of columns, reached by elevators and enveloped by uniform façades. While Mies van der Rohe’s office buildings, such as the high-rise building in Friedrichstrasse and the Burohaus, were attempts to redeem the generic form of productive space by subtly manipulating the envelope, Hilberseimer’s is simply the most literal representation of the open-ended logic of capital when it comes to the question of form. At the same time, Hilberseimer’s design shows how architecture, once it is emptied by the destructive character of economic management, returns to being what it used to be at the very beginning: an enclosed space, an absolute form. In this respect a crucial element in Hilberseimer’s project is the façade’s uniform pattern of openings. The pattern is the vertical projection of the logic of the interior’s structural grid. However, Hilberseimer explained how this formal solution eliminates the opening as an individual piercing element on the wall of the façade and makes the building appear to be a composition of pure volumes.8. See Ludwig Hilberseimer, “Hochhaus”, Das Kunstblatt (1922): 531 Hilberseimer’s interpretation of the principle of “the even covering of the field” within the plan, the section and the elevation of the building through a reliance on the simplest spatial and formal organization – the isotropic grid of columns and openings – has an ambivalent meaning. On the one hand, such organization of the building form derives from an attitude that has accepted the abstraction of economy; on the other, Hilberseimer develops a legible limit out of this condition by turning the spatial logic of the free plan against itself in the form of the absoluteness of the volume. The barest condition in which architecture can exist is presented here not as a stylistic exercise, but as a paradoxical act of representation, as a will to give to the conditions of the city its adequate form, whose meaning is the definitive renunciation of any will to representation.